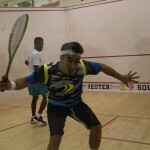 University of Rochester squash alum and current assistant coach Mario Yanez Tapia made history today. 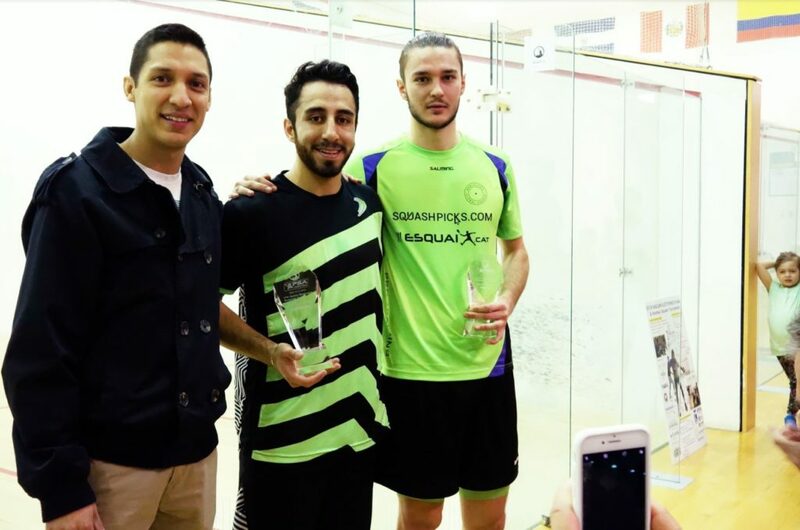 He is the first UofR alum to lift the Rochester ProAm trophy in it’s 16th year joining three other Mexicans and several other top PSA players on the illustrious roster of former Rochester ProAm winners. In this match-up, crowd favourite Yanez Tapia came out looking a bit sluggish against the British Graham, who was up for it with his mother — or at least a woman who looks a lot like his mother — in attendance. 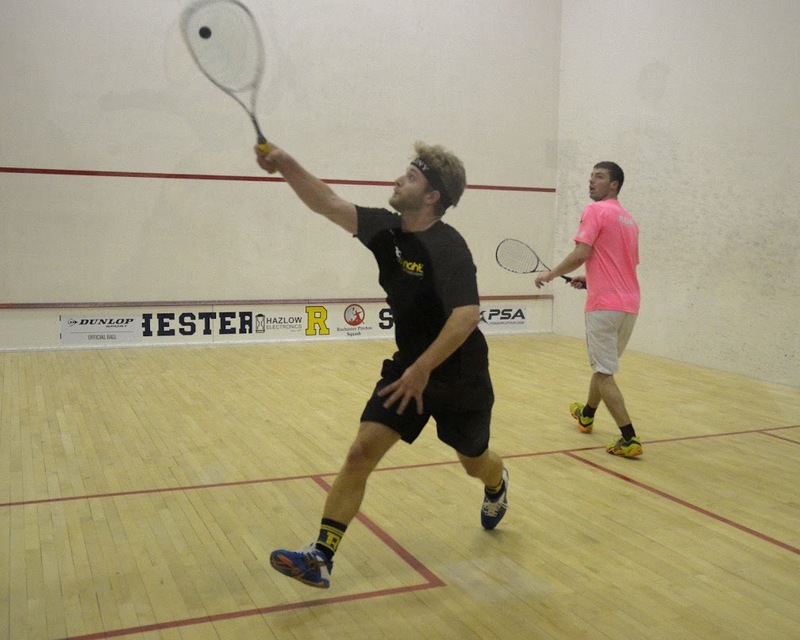 Graham used this sluggishness to his advantage and took the first game in and around 11-7. It was at this point that some younger members of the crowd began to seriously wonder whether Graham’s coolness was an act, or whether he was a zombie. Young GVC player Mark buried his head in his father, Ilya’s, shoulder and said, “please dad, don’t let the extremely relaxed man get me!” Which made everyone laugh, except for Anthony of course, who was pretty chilled about the whole thing. Yanez Tapia came out firing in the second and, subsequently, the third and fourth and ground Graham off the court in a gutsy showing, their second face-off in 3 weeks. Some people have said to me that Faraz Khan’s game is reminiscent of a beautiful painting, each brush stroke placed just so in a calculated illumination of an emotional idea. Like a Picasso, or perhaps a late Rembrandt. None of those people, however, saw this match. This match was a grinding, greasing, gesticulatingly wild affair. Fuller was able to push the American into four and had an opportunity at 11-11 to get more, but, alas, it was not to be and he lost. 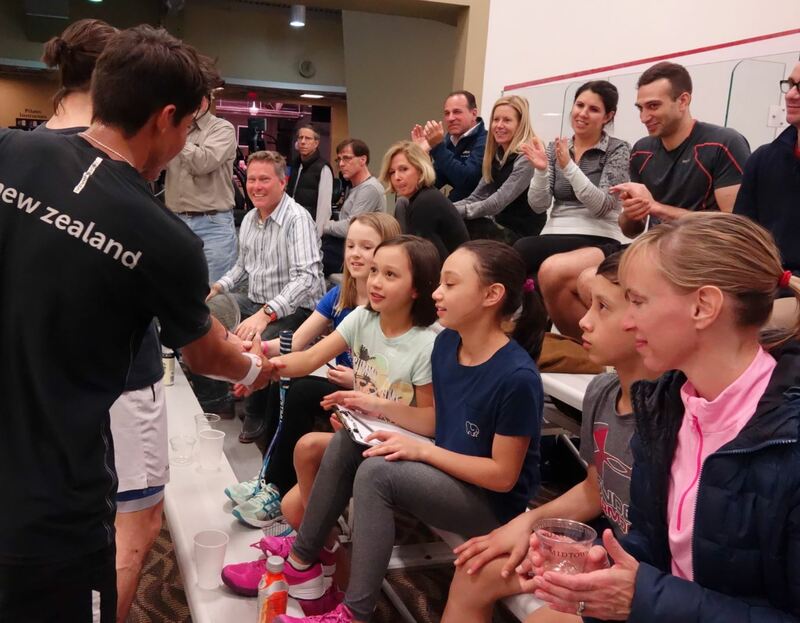 In number 1 seed Angus Gillams’ second match of the tournament the crowd was given a real treat, as he beat 2017 US Junior Open Champion Leonel Cardenas of Mexico in three games. 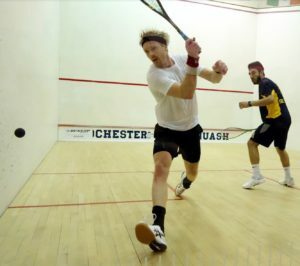 Despite that scoreline, the match was not wrought or brought withot some dramatic moments, especially given some truly creative refereeing by local amateur and Jonathan Power impersonator Leonard Mohr, who was seen at one point in the third game on court, demonstrating to the players what appeared to be proper forehand length technique. 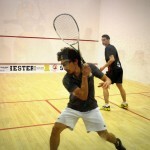 In this bought, the veteran Gillams used his extremely cutty strings to sashimi chop the young challenger. If ever there was a man — nay, a legend! — so compelling as the story of Bernat Jaume in this tournament, I’ve yet to hear it. 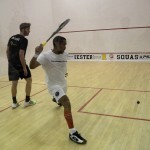 In the first round he took out country man Hugo Varela in a dramatic and fantastic four sets, which set him up to take on the Ponytailed Pakistani in the quarters. This match, I believe, was firmly decided by the play of the Spaniard in the front left corner hitting cross-court lobs, a shot for which Syed could find no answer. If my guess is as good as any, Bernat won in four games. 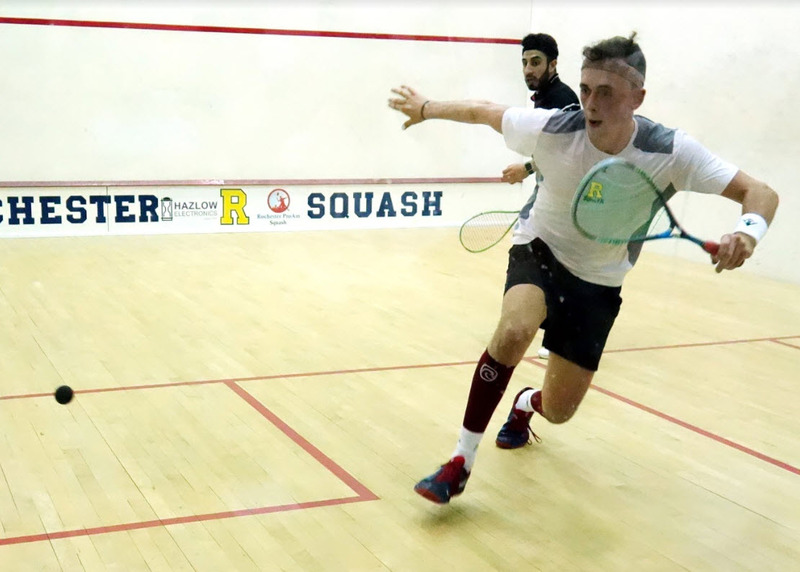 The first match of the night saw number 1 seed Angus Gillams of England face of against unseeded Noah Browne from Bermuda. The rallies began long without either one going for too many attacking shots. Though the rallies were long, neither player seemed to really find their length for the most of the game with the ball often loose and not reaching the back of the court, but Gillams length and control of the T was a bit better and so came away victorious in the first game 11-6. The second game was a bit better and both players started hitting more of their targets but Browne often opened up the court too early with loose boasts as well as distracting himself with the referee’s decisions leading Browne to lose 11-6 again. Involvement with the referee continued into the third game and Browne’s frustration with his own game led Browne to be unable to maintain his focus in the crucial points despite putting in a solid and very close last game, losing 11-9. 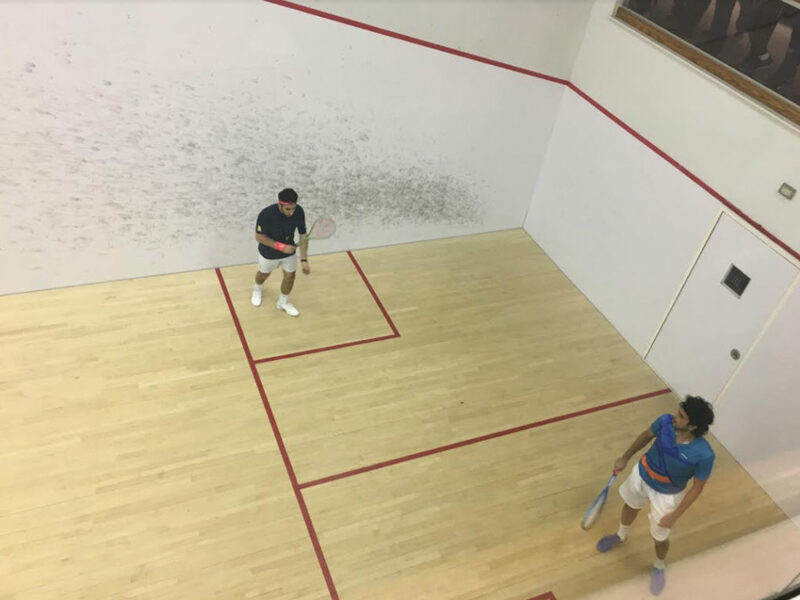 Leonel Cardenas the six seed from Mexico faced off against qualifier Cameron Seth of Canada who came back from 2-0 down to win in 5 against University of Rochester player Lawrence Kuhn. 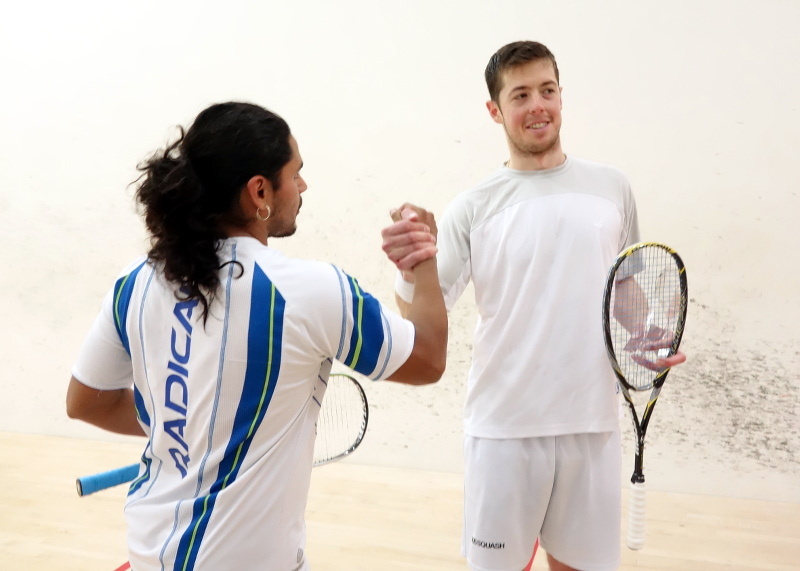 Both players started off well, finding good length but Cardenas was able to attack and control the T a bit better and came away with an 11-5 win in the first game. 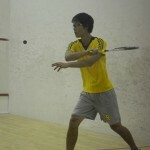 The second game Seth neutralized Cardenas’ attacking and deceptive shots with good tight length and won the game 11-8. 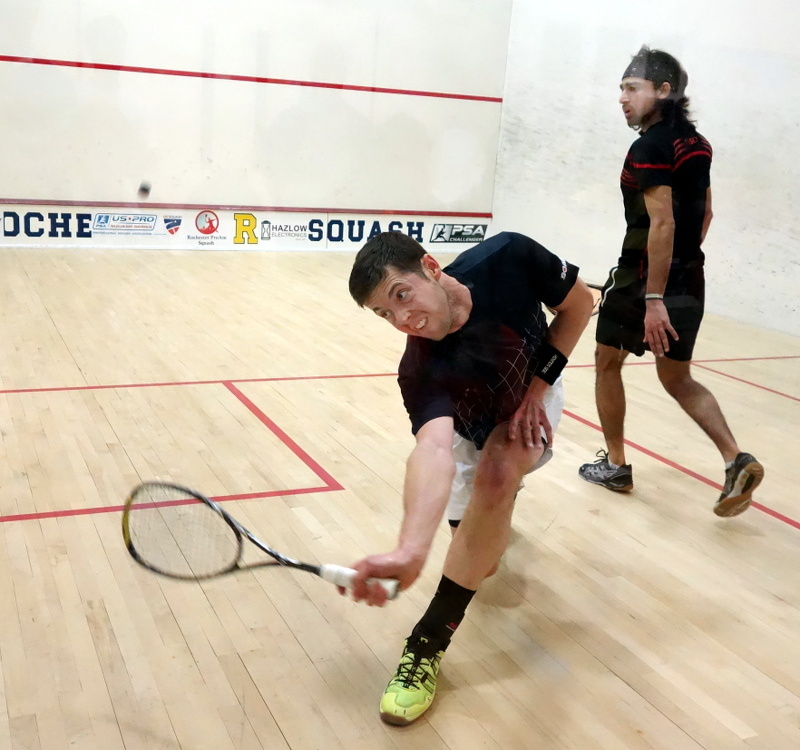 Seth was unable to follow up this performance the next 2 games, maybe feeling the effects of the previous night’s match and opened the court up enough for Cardenas to use his lethal attacks winning the next 2 games 11-3, 11-4. The third match of the night saw Spaniard Bernat Jaume face off against compatriot Hugo Varela in their first professional match against each other. The first two games were incredibly long, incredibly close with rarely a point between the two, with each winning a game apiece. The third game saw Hugo lose focus going from a 4-4 tie to an 11-4 loss. In the fourth game Hugo put 110% in, and at 3-4 down had the rally of the match, nearly doing the splits multiple times sprinting from corner to corner, and then following up with a sick crosscourt nick! 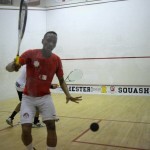 Unfortunately he could not keep up the intensity and just faded ever slightly losing 11-6. 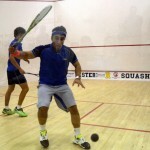 Syed Hamza of Pakistan played Alejandro Reyes of Mexico in a bewildering 5 setter. 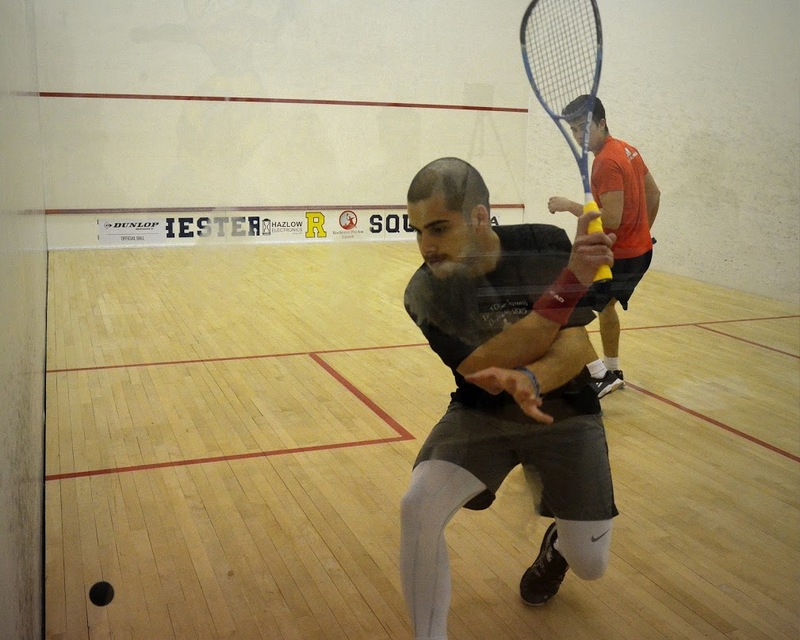 Hamza came of firing on all cylinders, mixing up his use of height with hard shots enabling him to control the T and win 11-1. 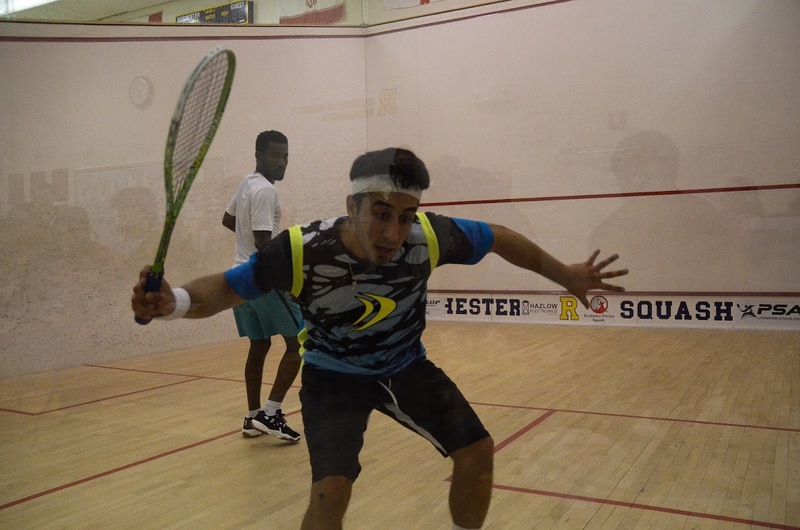 It looked like everything was in Hamza’s favor, but Reyes came back punching with an 11-2 win the next game. 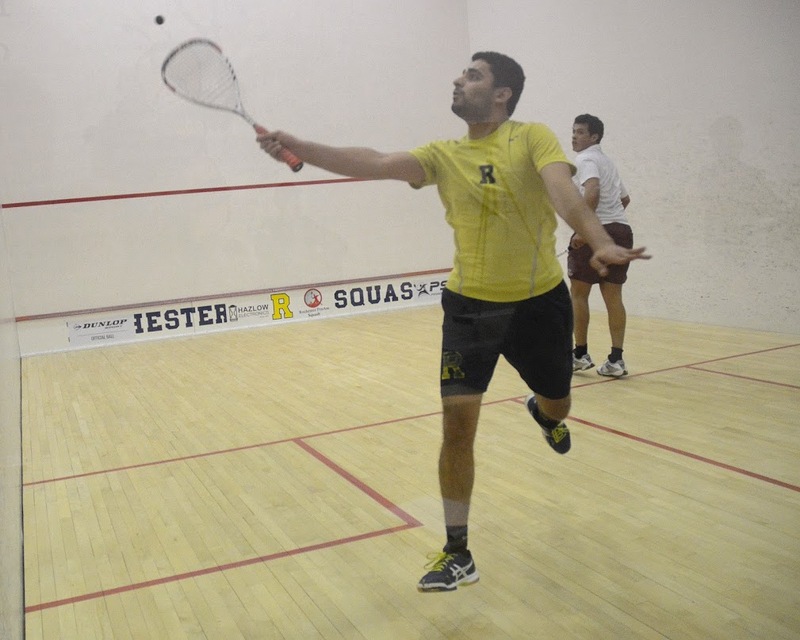 The third game both players found their rhythm, hitting solid length, with long, grueling rallies, but though visibly tired Hamza came through and won 11-7. The next game Reyes controlled the T more, and used his speed to force errors from Hamza. 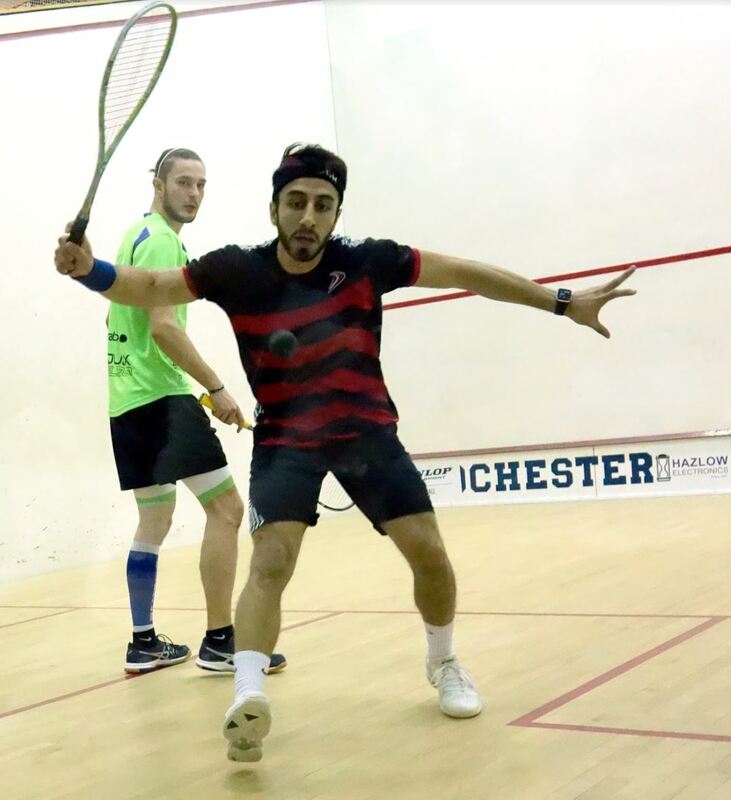 Play was stopped though with Reyes 8-4 up due to a blood injury, and this allowed Hamza a bit of a breather, who came back firing, but still lost the game 11-7. The last game, both players could not find their length and did not take advantage of loose balls due to nerves. 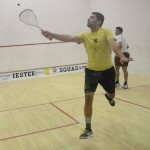 Reyes hit a bit too many boasts opening up the court a bit too much and Hamza played a bit safer and won 11-8. This was the match of the night. Or, if it wasn’t, it was a match played tonight. Graham came out swinging in that cool, very relaxed Grahamian way that almost says, “I wonder what the score is on the next court” which is funny because during the second intermission he actually did say to me “what’s the score on that court?” and then proceeded, with the referee, to come watch a few points of the Davies-Yanez Tapia match which was, frankly, a banging match. But I’ll get to that. In any case, Graham used his chilled out, British modern swing to push Cromwell to — and past! — his breaking point. The first two games went relatively smoothly for the championing Graham. 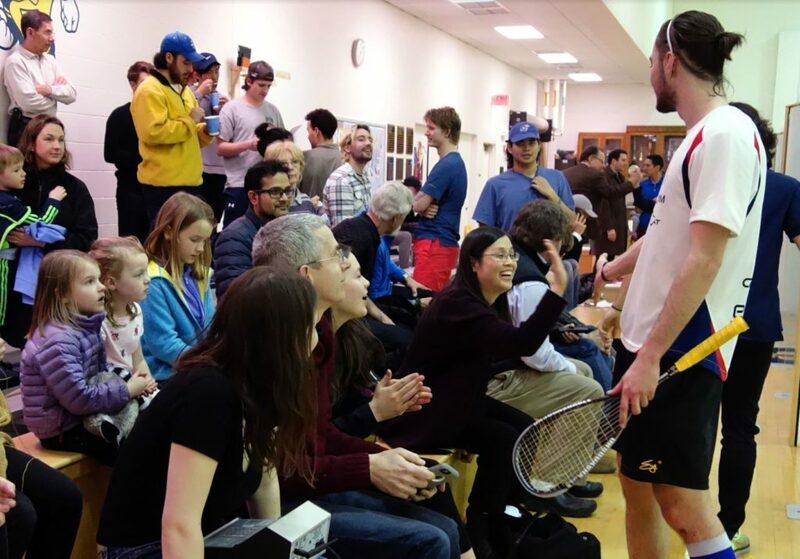 The third was tighter, in the realm of 11-9, and members of the audience were caught remarking that perhaps he ought to spend more time playing his match rather than coaching his friend Ashley Davies. Fondest attachments to both players. Now this one, this one, this one! was the match of the night. Well, it was a certainly up there. What was really worth remarking about — and I did remark about it, to several interested parties, if you must know — was the back story: current University of Rochester wunderkind Ashley Davies — scourge of the basketball house front garden, king of Vinyl! and, I guess, 2nd team All-American –versus the University of Rochester’s all time leader in wins and winning percentage, four time first team All-American and current assistant coach, Mario Yanez Tapia. Davies took the first in a compelling decision, and the crowd was, like, totally thinking he could win. And then it went to 8-8 in the second, a three minute rally, and Yanez showed the crowd what he’s packing in the tank. Ashley played valiantly, but couldn’t keep up with the streaking, peaking, nick-seeking Mexican, who pulled out all the stops and put some back to come out on top, 3-1. 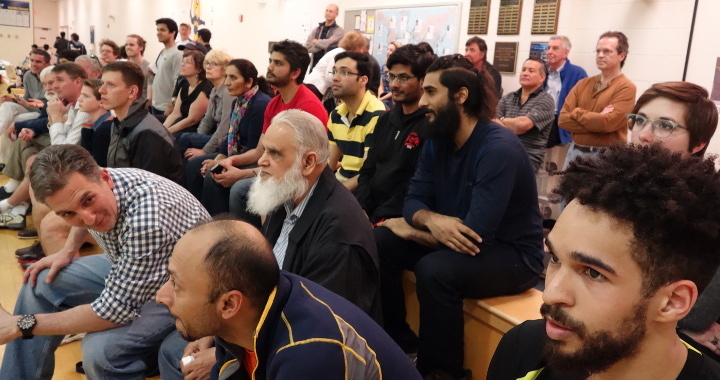 In another battle of University of Rochester related people, Faraz Khan of the great state of Connecticut took on local non-local player Tomotaka Endo who, despite his PSA card’s opinion, is a representative of the land of the rising sun, Kawasaki, Japan. Unfortunately for the thoroughbred-legged Tomotaka, the courts in the UR athletic centre were the land of the rising tin, and he made that much abundantly clear to everyone watching — listening, even! — to the match. In the end, Khan showed some wily veteran control of the ball, and some wily veteran letting loose of his emotions to take the match 3-0. Cudos to him. What is there to say about Tim Lasusa that hasn’t already been said? Tall, handsome, coy, an absolute charm with the ladies and the gentlemen alike, and heir-apparent to Gilly Lane as MC of the US Open are all thoughts which spring to mind. Oh, and he’s a great fisherman! Oh! 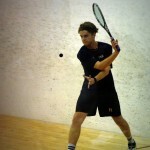 He’s also a decent squash player! Tim, Tim, Tim — what a guy! 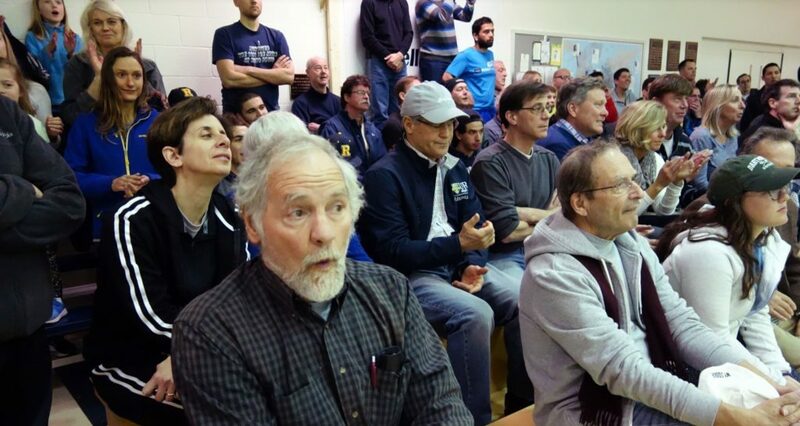 Well, anyway, he lost to Mark Fuller 3-0. The action of the Rochester ProAm qualifiers would continue at Genesee Valley Club in Rochester, New York. 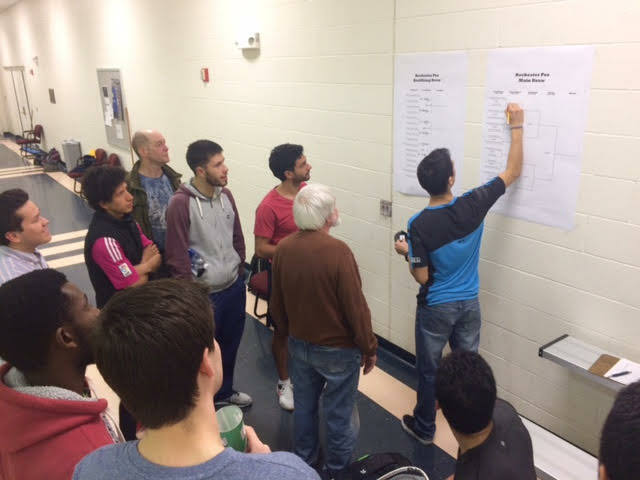 The second round of the qualifiers had four great matches with the winners advancing to the main draw. prove too much for Bassil. 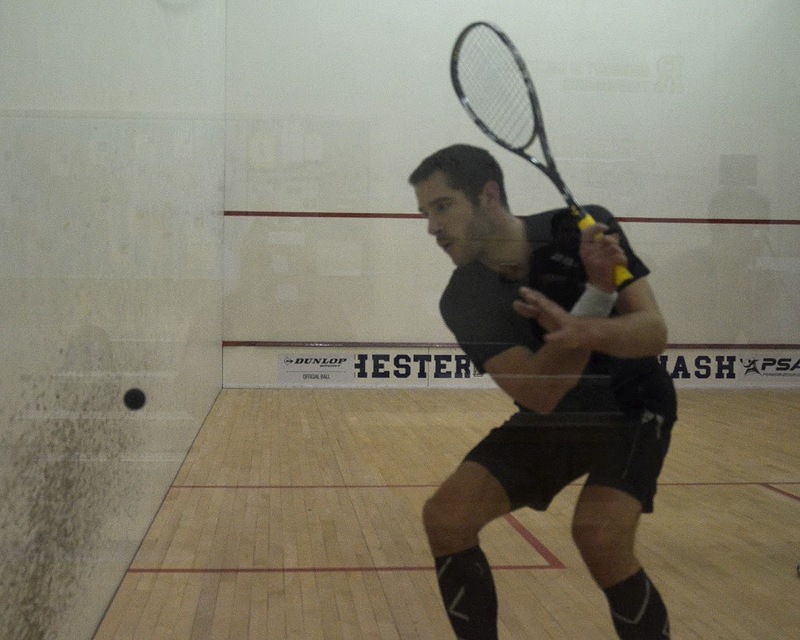 Yanez would advance to the main draw in three games with a score of 11-6, 11-5, and 11-6. 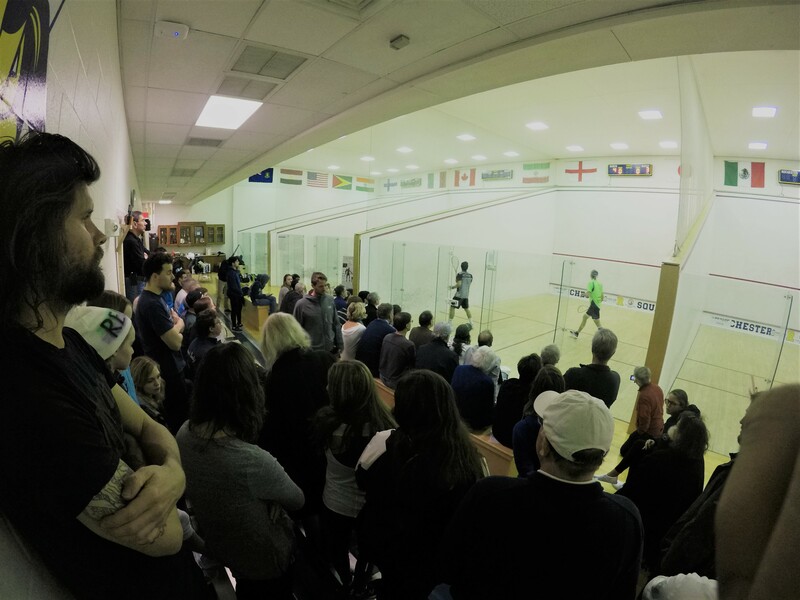 The third match came on after the Yanez-Bassil match, and was a contest between Spaniard, Hugo Varela, and Canadian, Brock Janzer. Janzer would put up a fight against the second seed of the qualifiers; however, Varela remained unfazed throughout the whole match. 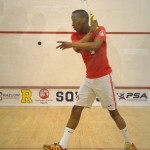 Varela would then proceed to dispatch his Canadian opponent in three games: 11-0, 11-1, 11-4. 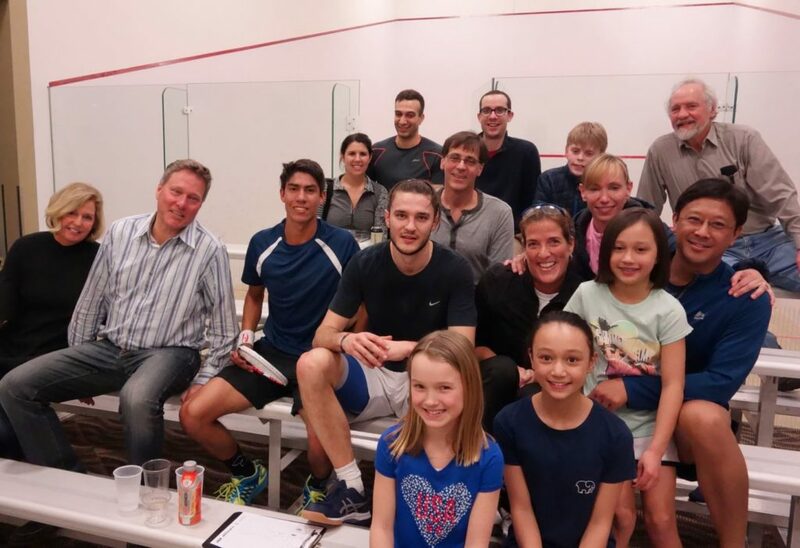 Meanwhile visiting pros Bernat Jaume and Alejandro Reyes gave the local juniors and adults/sponsors alike quite a show at a series of lessons as well as an exhibition match at Midtown Athletic Club as part of the tournament’s proceedings. 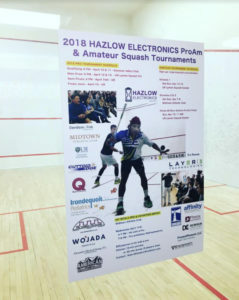 After a brief hiatus in 2017, the Hazlow Electronics Rochester ProAm is back again this year in it’s 16th edition and promises to showcase top up and coming squash talent from around the world once again. 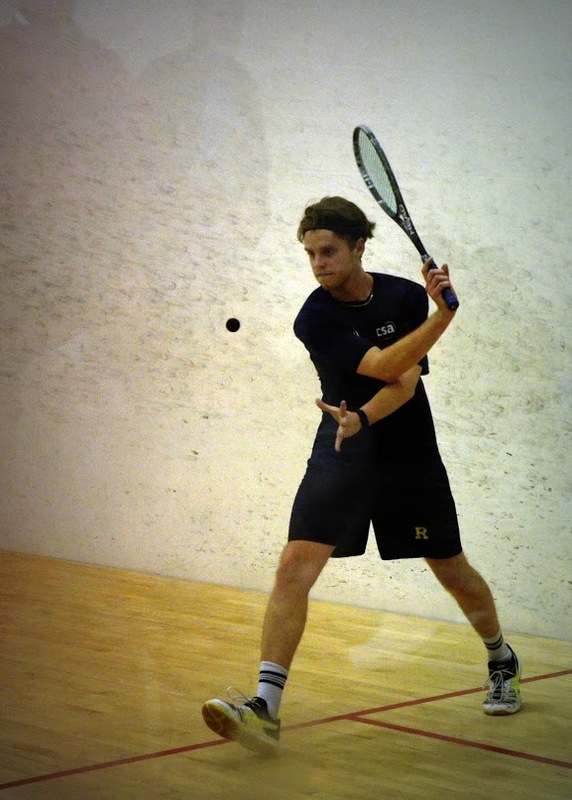 In a strong showing last night, the local lads from the University of Rochester squash team prevailed over stiff competition from their PSA opponents last night in the opening round of qualifying . 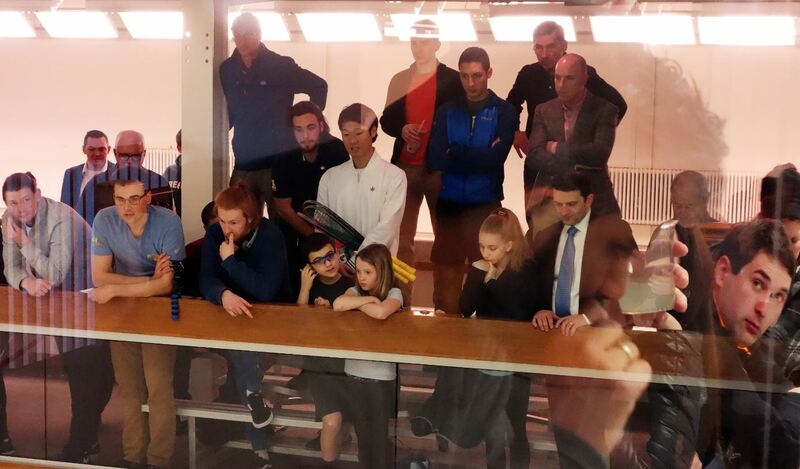 For some, the luck of the draw meant this was the toughest PSA 5+ qualifying draw they have had to play in a while with several matches going the full five games. 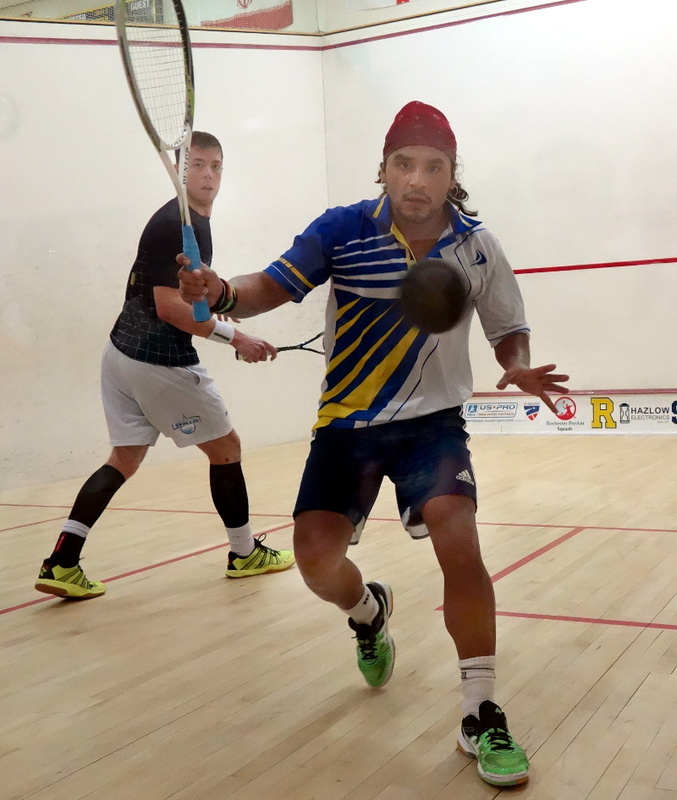 Former UR #1 and current assistant coach, Mario Yanez fresh from his final appearance in another PSA 5+ event Charlottetown on Sunday started hard and fast against India’s Aditya Jagtap taking a quick 2-0 game lead. 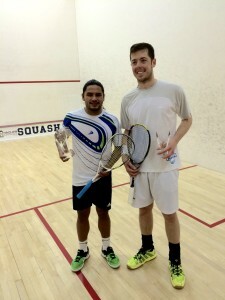 Jagtap was not giving up however and came back fighting from 9-3 down in the third game to stay in the match. 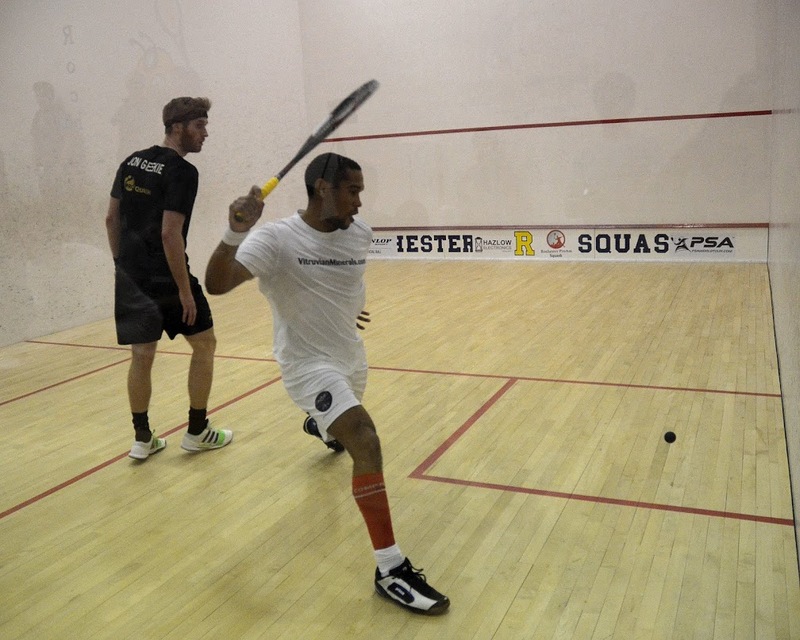 The fourth was a closely contested game at the start but eventually Yanez got the better of his opponent to earn a spot in the next round. 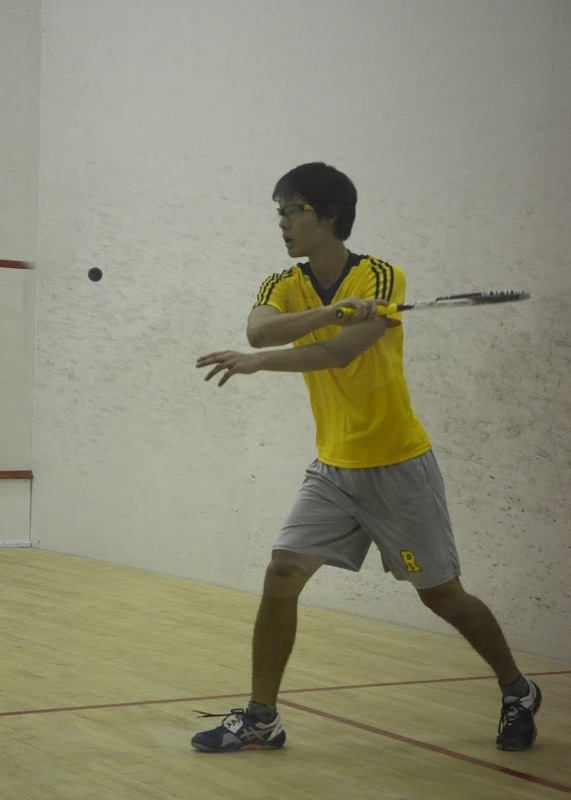 Another University of Rochester local, Tomotaka Endo faced stiff competition from fellow college squash player and Columbia freshman, Velavan Senthilkumar from India. These two had faced off in college squash twice already this year since February with Velavan prevailing in both those encounters. However, Endo seemed learned from those matches and put that experience to good use forcing errors out of Velavan in the early games. Velavan kept the pressure on nevertheless and had Endo on the ropes in the 4th game when an injury break from Vela gave Endo a much needed breather. Thereafter, there was no stopping the Japanese senior who forged ahead into the fifth forcing additional errors from his opponent to eventually take avenge his previous defeats. 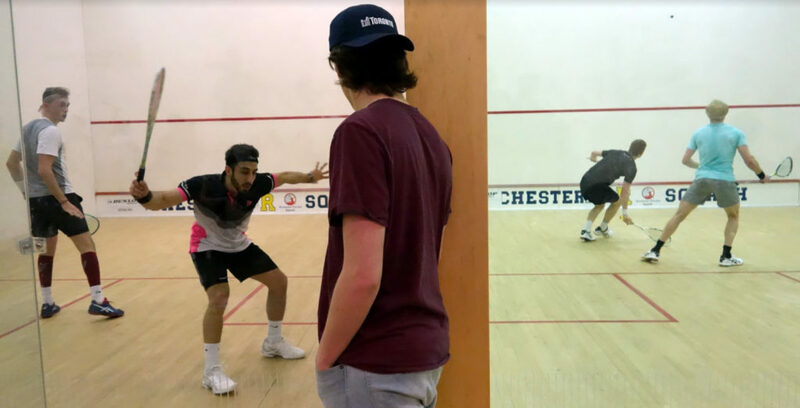 In what seemed like a pattern of comebacks, Endo’s other two University of Rochester team mates, Ricardo Lopez and Lawrence Kuhn starred in their own battles both coming back from two games down against their opponents, Canadian Ahad Raza and Englishman Sam Fenwick respectively. Tomorrow’s qualifying finals feature at least two of the four University of Rochester lads, Tomotaka Endo and Ricardo Lopez facing off against each other. Eric Galvez made history by becoming the only player to make it twice to the finals of the Rochester ProAm in it’s 14 year history. Two years ago Eric lost a hard fought five game, 102 minute battle against Frenchman Lucas Serme. This year he came back to win the title in spite of the tall Jamaican Chris Binnie stands in his way. Chris is no stranger to Rochester himself having entered the event every single year since 2012. 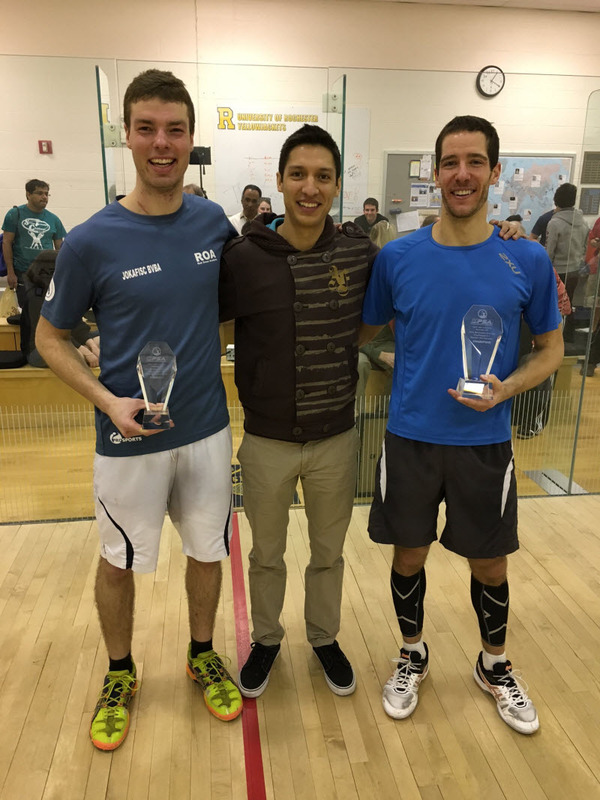 In the last fourteen years since the event began,Eric is the third Mexican professional to win the Rochester ProAm title following in the footsteps of Jorge Balthazar Ferreira (2007) and Alfredo Avila (2011)! 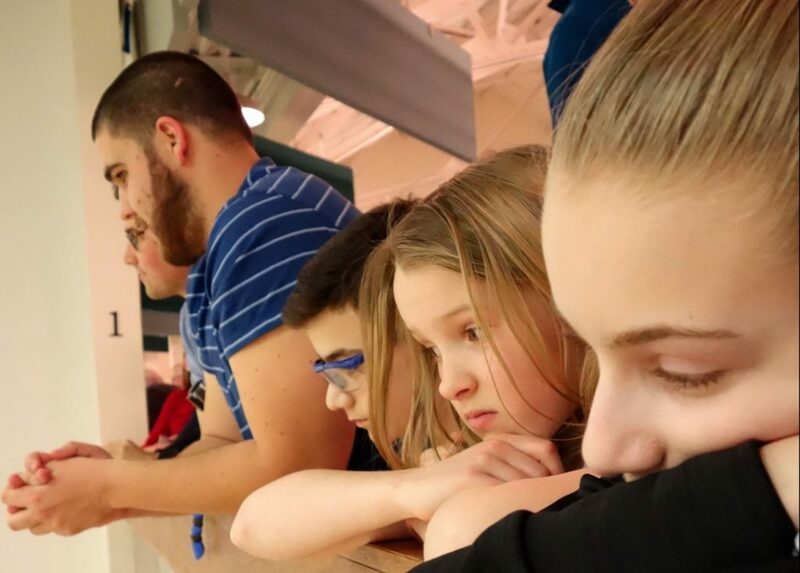 The crowd was exciting this morning for a Rochester ProAm final featuring two fierce competitors who had risen to the top of the tournament bracket. 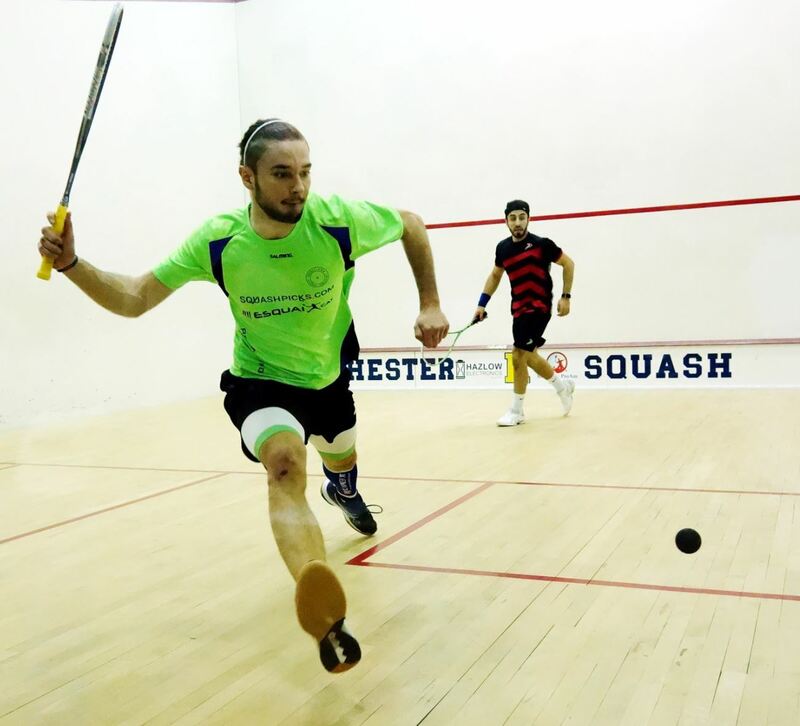 Eric Galvez, the experienced Mexican, and Chris Binnie, a relative newcomer to the tour hailing from Jamaica, had beaten foes from all corners of the squash world to now face down for the Rochester crown. The match started off tight, with the typical long rallies at the beginning of the match. Chris tried to use his wingspan to stay in front, while Eric used speed and length to counteract. From 4-4. the balance of the game seemed to shift. Eric seemed to expect Chris’s aggressive tactics and was counteracting via slow, tight rails. Chris kept on going shorter and lower until he clipped the tin. Eric took advantage of Chris’ mistakes and won the first 11-7. The second game was odd. The first few rallies seemed normal, but then Chris seemed to have a mental hiccup. The next eight points all went to Eric, six of them coming from unforced tins by Chris. Even after shouting “Focus!” to himself, Chris couldn’t seem to regain any rhythm. 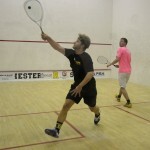 Eric won the second 11-2 and had all the momentum heading into game 3. Although Chris fought hard in game 3, Eric smelled victory and would not allow Chris to gain a foothold. 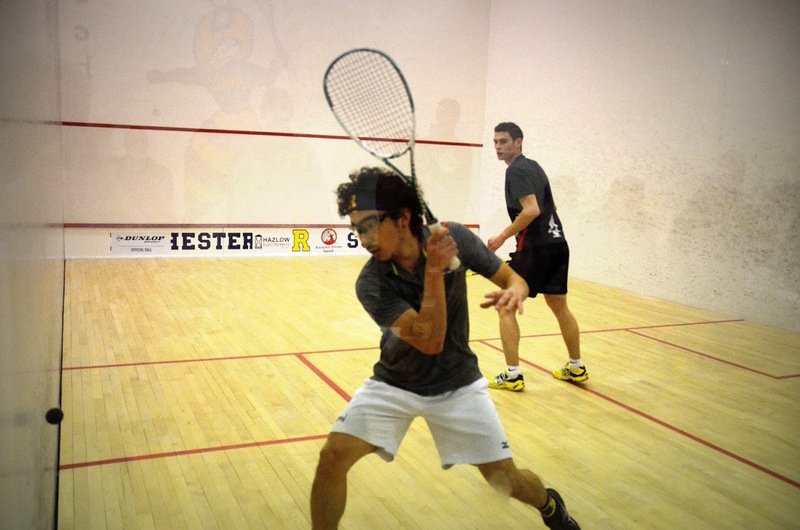 At 2-2, Eric strung together some of his finest squash of the week to grind out a 6-2, then 9-3 lead. Although Chris managed to pull back a few points, Eric closed out a loose shot on his third match ball to take the 11-6 victory and win the Rochester ProAm! 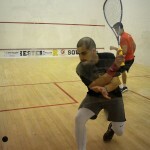 Eric Galvez makes history by becoming the only player to make it twice to the finals of the Rochester ProAm in it’s 14 year history. 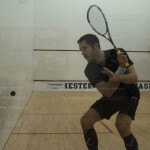 Two years ago Eric lost a hard fought five game, 102 minute battle against Frenchman Lucas Serme. This year he has a chance once again to win the title. But the tall Jamaican Chris Binnie stands in his way. Chris is no stranger to Rochester himself having entered the event every single year since 2012. Will it be fourth time lucky for Chris? We’ll find out tomorrow at noon! 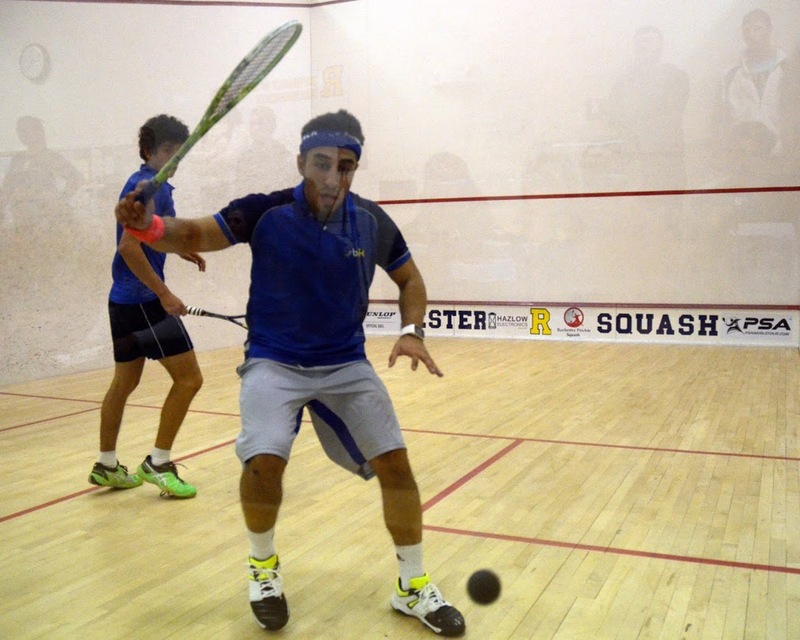 It was a long, exhilarating night of squash with some thriller 5 set matches lasting almost until 11pm. Two qualifiers (including one Yellowjacket team member) proceed to the quarterfinals tomorrow. 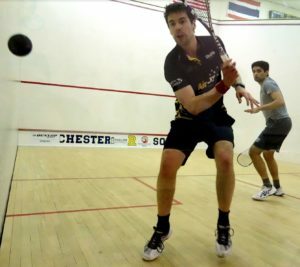 Two clashing styles met in this battle of larger-than-average squash players, with the attacking, arrhythmic Canadien Albert Shoihet facing off against the steady, volleying Jamaican Chris Binnie. Game 1 showed why unorthodoxy can sometimes be the best strategy. 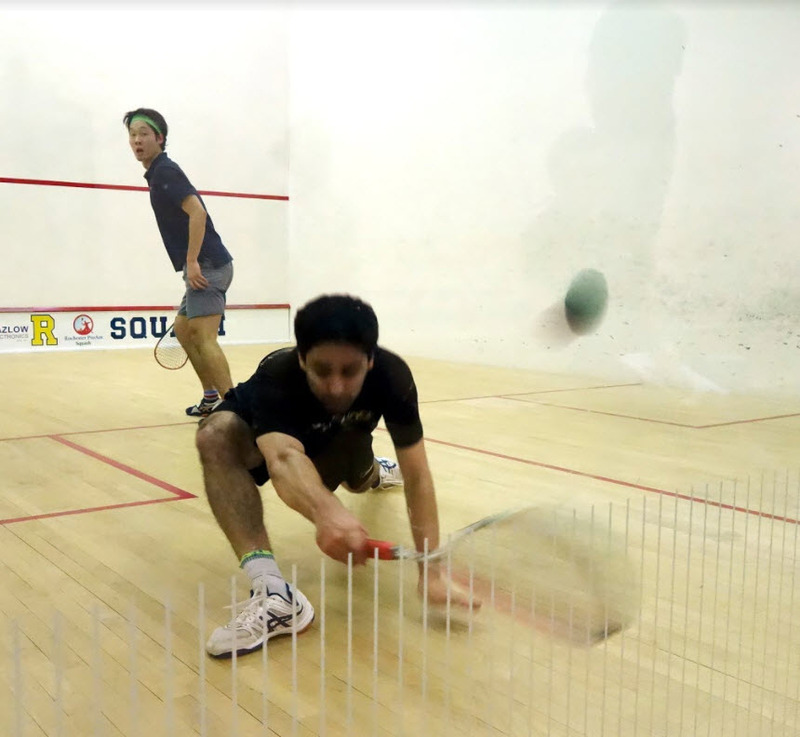 Binnie came out and played normal squash, and therefore was completely caught off guard by Shoihet’s flicks, drops, and steady stream of unexpected shots. Although the game finished 11-7 to Shoihet, it never even felt that close. 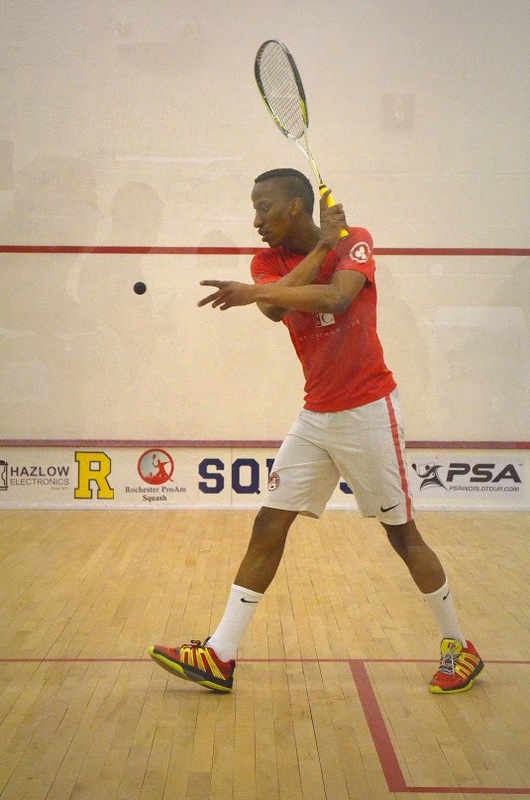 But, for the rest of the match, Binnie showcased how the “classic style” of squash has gained its name. 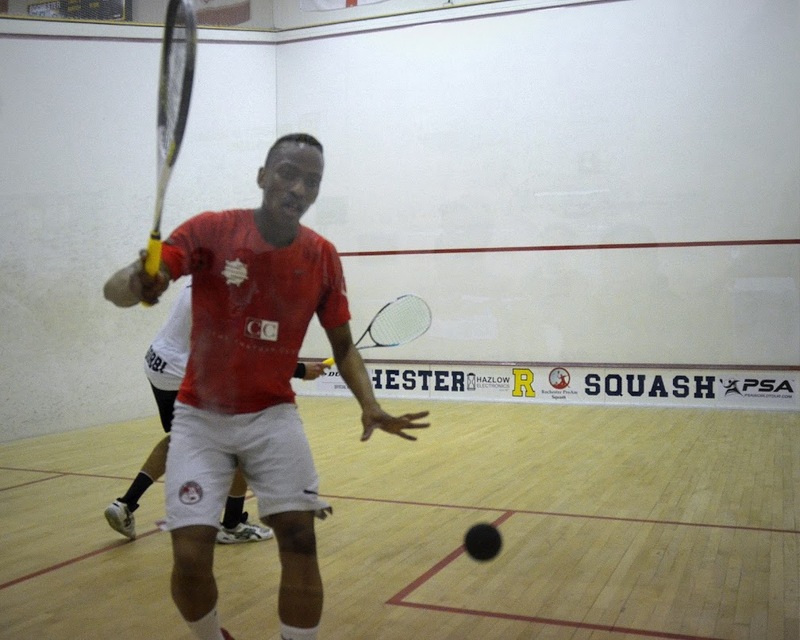 The tall Jamaican dominated the T, volleying everything passing near his expansive wingspan. Shoihet was relegated to digging shots out of the back corners of the court, which is simply not a sustainable pattern of play. Even when Shoihet would string together a cluster of high-pressure shots, Binnie would fall back on tight shots and lobs to regain control. 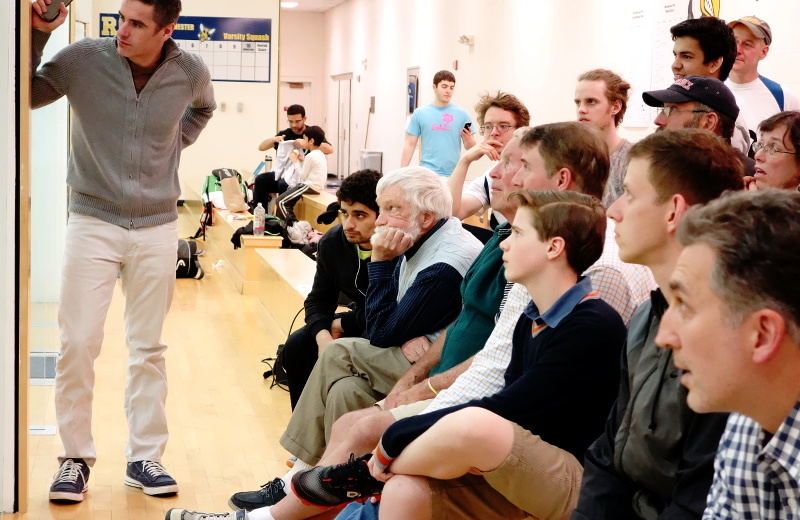 The match never seemed close again, and Binnie cruised in games 2 through 4 11-3, 11-2, 11-3.